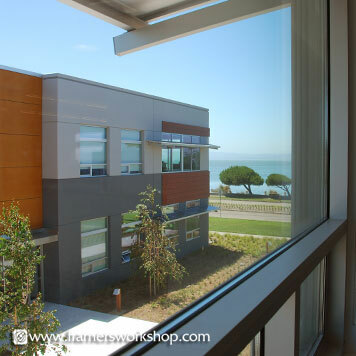 RAPT Studio is a global, award-winning design practice that believes great design can transform the work environment. 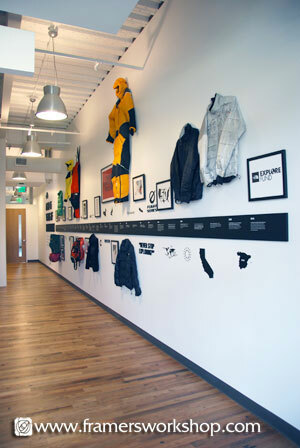 Based in San Francisco with offices in Los Angeles and Delhi, RAPT is a group of passionate designers who see the big picture, and is determined to help their clients connect brands and environments to the people who use them. 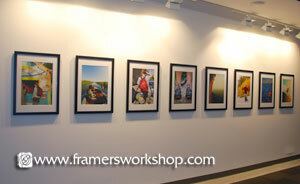 This project was completed for their client, VF Outdoor America. 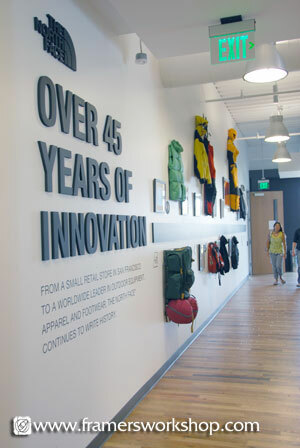 VF Outdoor America is a $9 billion apparel and footwear powerhouse, with an incredibly diverse, international portfolio of brands and products. 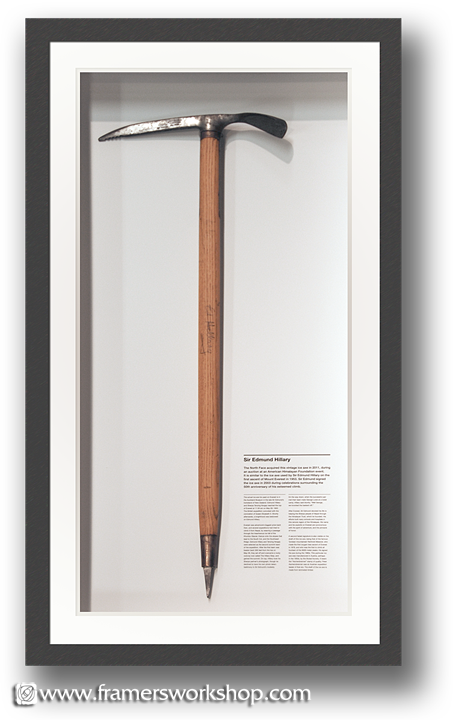 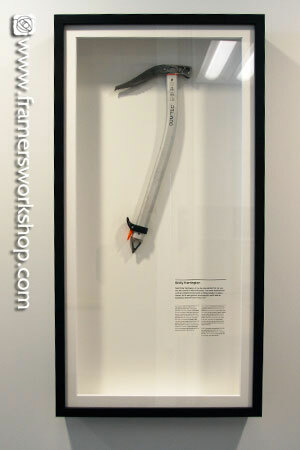 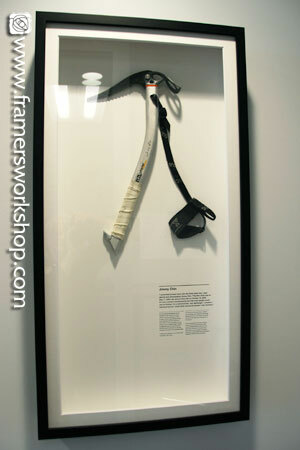 We framed this collection of ice axes in an archival fashion using plastic covered wire attachments that matched the colors of each shaft. 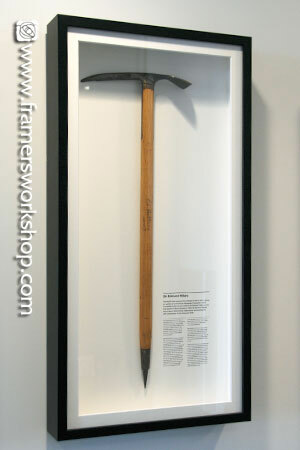 By printing the client's text describing the history of each axe directly onto the backing, we were able to fulfill the designer's vision for the project. 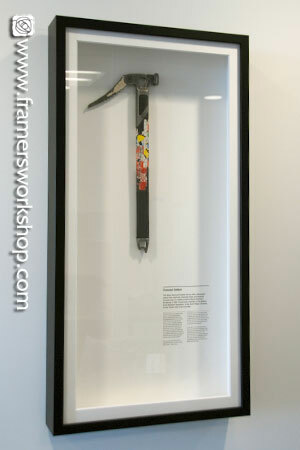 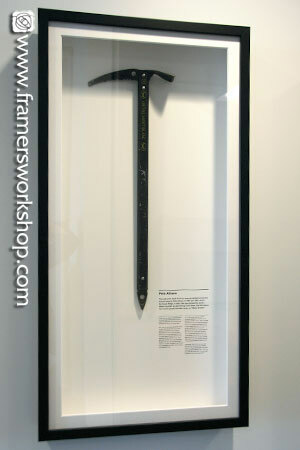 Each axe is protected in a deep shadowbox frame, surrounded by preservation quality mat walls with an extra thick 8 ply top mat and ultraviolet protective acrylic. 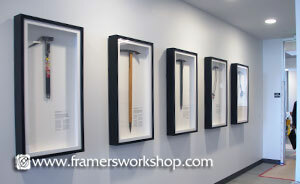 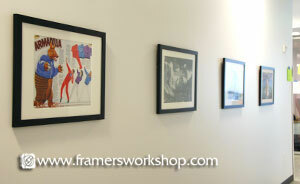 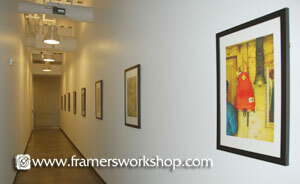 The frames measure 20" x 40." 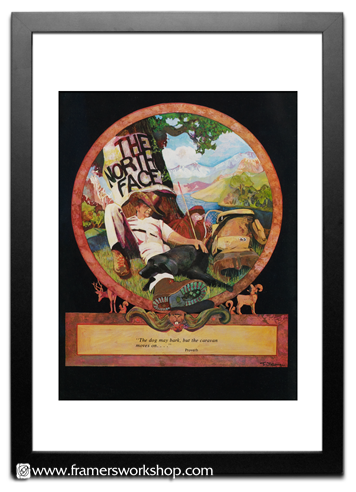 Click the image to the left to see a larger view. 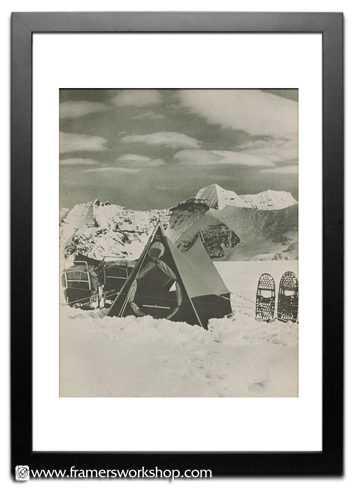 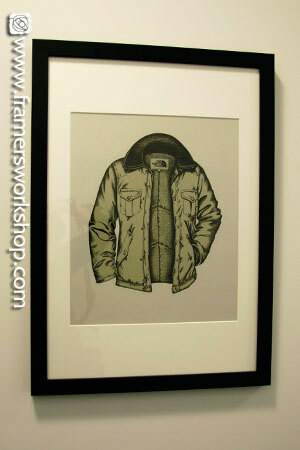 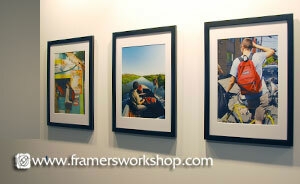 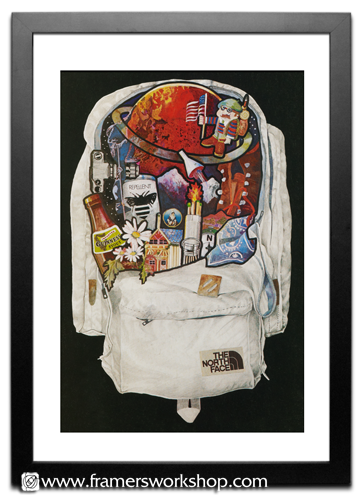 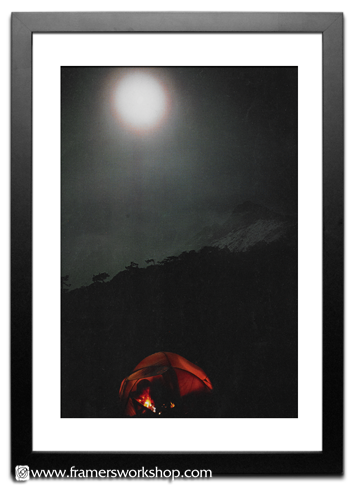 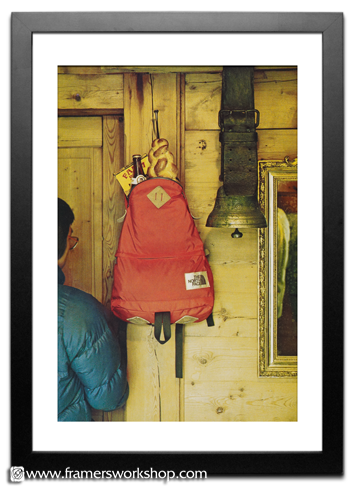 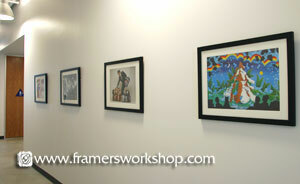 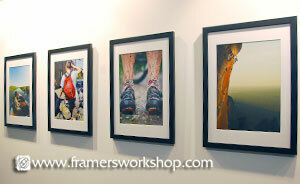 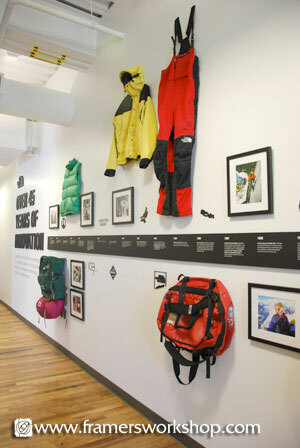 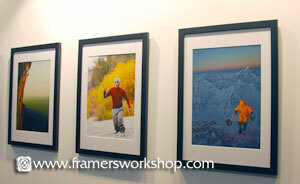 Working with RAPT’s designers, we printed, framed, and installed historical photos from The North Face history. 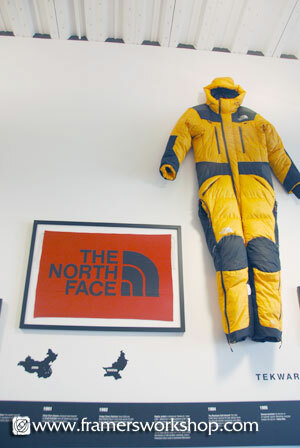 We also framed a North Face flag, and installed several items of vintage athletic gear and garments at strategic points along the timeline. 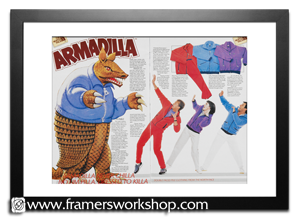 Rapt Studio provided detailed mock-ups of all work prior to production, and they made our work easier by providing these organized layouts for each phase of the project. 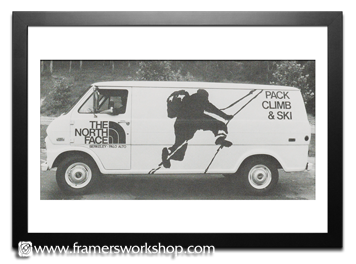 This collection of historical Northface photographs was given to us in digital format so that we could edit and enlarge each image for uniformity within a matched frame size collection. 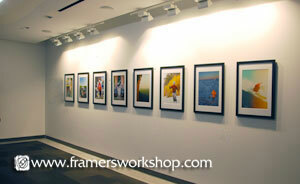 Our installer placed the frames in strategic areas throughout the new VF Outdoor campus. 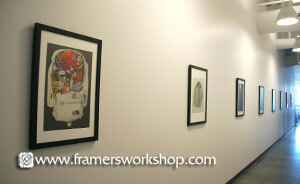 It was a pleasure working with both RAPT Studio designers and the VF team.